Newell Composites is a specialist manufacturer of composite reinforced plastic (FRP) storage solutions for industrial applications. The company’s portfolio ranges from custom-built, chemical-resistant tanks, to pressure vessels, insulated ‘twin-walled’ hot or cold tanks, degasser vessels and ducting systems. Newell Composites provides a complete range of corrosion-resistant tanks and equipment designed for corrosive chemicals, and all industrial and municipal engineering applications. We offer protection from a wide range of acids and alkalis, as well as weathering, spillage and corrosive fumes. Our tanks are specially fitted out, designed to industrial or Australian standards, fabricated and purpose-built to meet a client’s requirements. Newell Composites builds customised FRP-insulated storage tanks for either chilled refrigeration or hot / boiling liquids such as methanol glycol or boiler water feed tanks. Our specially designed boiler tanks are able to hold water of temperatures up to 99˚C, whilst our refrigeration tanks are suitable for sub-zero temperatures. 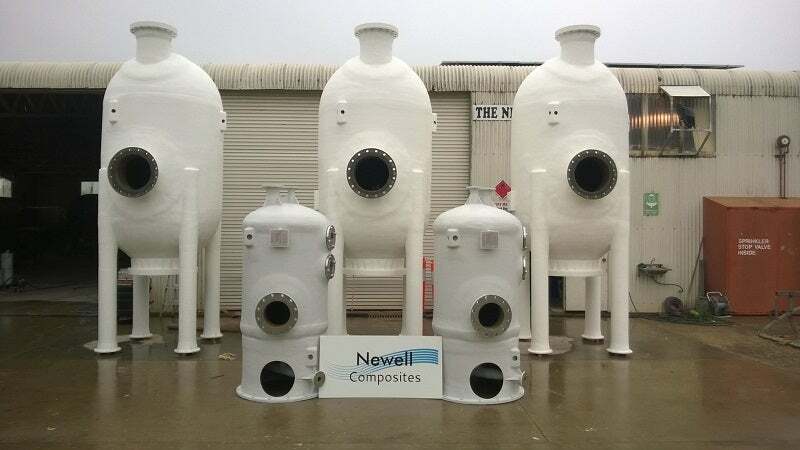 Newell Composites manufactures a wide range of corrosion-resistant tanks and equipment designed for a wide variety of acids and alkalis, as well as weathering, spillage and corrosive fumes. Each tank comes with full design calculations and reports, along with full inspection and sign-off. The main production process for Newell Composites tanks are built using the filament winding ‘Hoop-Chop’ method to design codes and compliance with industry certifications such as British Standards (BS) EN 13121-3: 2016, American Society of Mechanical Engineers (ASME) RTP-1: 2011, Australian Standard (AS) 2634: 1983, as specified within supplied specifications and advised by qualified engineers. This process produces tanks with high-strength hoop and wind loadings and a smooth interior finish, where the correct material is recommended and documented by suppliers to optimise performance for a high chemical-resistance. All products are post-cured to ensure total quality and strength. Vessels can be colour-coded to meet on-site chemical requirements and policies for an easy visual notification of the substance stored. Conductive materials can be used during production of the vessels and associated flanges, fitting and bracketing to enable earth leakage with the likelihood of any static build-up during process conditions. Newell Composites’ inspection and test plans are supplied with all necessary chemical-resistant and pressure vessels, as well as degasser units as required by the client. Full inspections are carried out with our in-house quality assurance (QA) system and by qualified independent inspection authorities as required. Newell Composites’ team has multiple qualifications that include certificates in polymer processing, working at heights, and working in confined spaces. We work in conjunction with clients, design engineers and draftsmen when required to design and construct a vessel that suits the needs of the end client.